I enjoy second chance love stories and Katie Lane brings us one with plenty of humor, heart and a twist of mystery. Starlet Brubaker hails from humble beginnings and her heart is firmly attached to the man who showered her with kindness, enveloped her with (brotherly) affection and bolstered her confidence enough to pursue a career in music. Unfortunately, he's married to someone else but Starlet has a plan. That plan goes off the rails when she's rescued from a botched kidnapping by the youngest brother of her object of affection. The last time she saw Beckett Cates, he was a skinny, nerdy kid. My, how a few years - and the Marine Corps - have changed him! When Star is forced to leave the concert tour and seek refuge in her small hometown, it's Beckett who signs up for bodyguard duty...and a whole lot more. Going back to her roots reminds Star of the person she used to be before Nashville and her controlling manager took charge. As she slowly peels away the trappings of stardom will she recognize the love that has slowly grown between her and Beckett or will her obsession with another cause her to lose her chance at happiness while putting another's at risk as well. This is my first book by Katie Lane and I enjoyed it. Lane does a great job of drawing fully dimensional characters with all their associated strengths and weaknesses. She shows particular adeptness with Starlet, a character that could have easily fallen into the "hated heroine" category. She walks a fine line with her but succeeds in revealing a conflicted, misguided woman who ultimately looks deep into her heart and does the right thing. I adored Beckett, another character with a necessary journey of personal growth ahead of him before he is able to claim not only the woman he loves but his rightful place in his testosterone-laden family. Lane surrounds these two with a rich, multi-dimensional cast of secondary characters who bring small-town Texas life to light. One drawback for me is that, as stated above, The Last Cowboy in Texas is the seventh book of a series, a fact that quickly became apparent as I started reading. While I enjoyed the story line, Lane's snappy dialogue and the intrigue woven throughout, there were many times when I felt like the new kid in school who doesn't share the combined history or inside jokes of the other students. The Last Cowboy in Texas is able to stand on its own but I think my enjoyment of this story would have been magnified ten-fold had I read the six previous books first, something I plan to do in the near future. Thanks for the heads up. 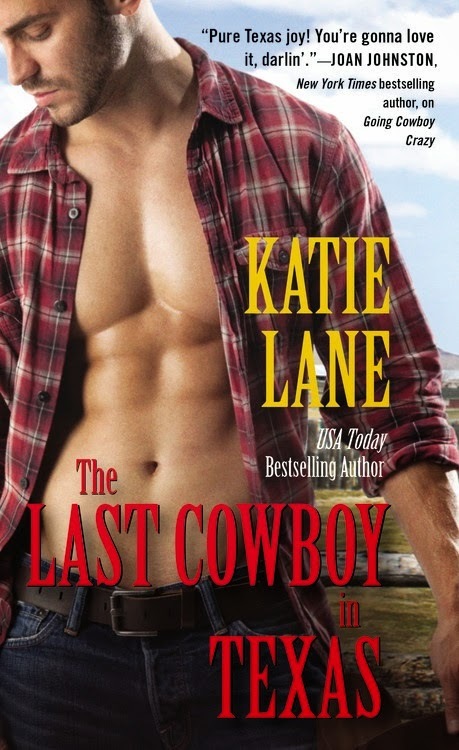 I love cowboy heroes, humor and passion in books. I will look for Katie Lane's series. Hope you enjoy it, Laurie! There seems to be a problem with the Rafflecopter link. We're working on getting it fixed. Thanks for your patience! It is fixed now! Thank you for this. This book sounds really good and it's been added to my TBR. Thanks! Thanks for letting me know, MsAwesome! Katie's books are such fun! I've only read a couple of Katie's books. I did enjoy them. I'll have to hit the library and catch up on this series Thanks so much for your review. Hope you enjoy them, Carol! I haven't had the pleasure of reading any of Katie's books yet. I love stories with cowboys, humor, and passion. Thanks for the giveaway! I love stories with cowboys, humor, and passion. This should be right up your reading alley! How did I miss this one coming out?? PUtting it on my wish list.... Love your books!! !